"Protagonists of Life and Culture" was the calling for the Day of Young Believer on Saturday February 7, 2015. The event, organized by the Archdiocese of Mexico since the last 30 years, had this time a special guest: Our Lady of Czestochowa when in this occasion many young people struggle to live in a context of great disparity and underlying violence. The presence of the Mother of God and Men means bright light of hope for them. Previous afternoon the icon was taken by custodian families of Mexico to the oldest Seminary of America. The purpose was to wait for the young faithful participants. The director of the event, Fr. Juan José Cedeño and young collaborators, received Her. 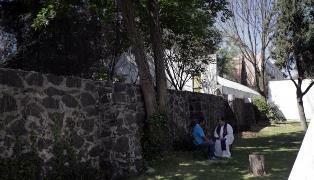 Place of meeting was in Huipulco, Tlalpan, 11.9 kilometers from the custodian Parrish. Young Believer Day is held annually on the occasion of the feast of the patron of the Archdiocese: St. Felipe de Jesús, the first Mexican martyr and patron of Mexican youth. After a turbulent youth as a Franciscan monk he ventured up to the Philippines. On the way back the ship was taken over by the Japanese, who in Nagasaki on February 5, 1597 crucified and pierced with spears the whole group of missionaries and their companions. St. Philip had reportedly predicted that one day the city of Nagasaki will be destroyed by a fireball falling from the sky. Nearly 350 years later, August 9, 1945. Nagasaki, the city with the highest number of Catholics in Japan, was completely destroyed by the explosion of the atomic bomb. At that time the largest Catholic church in Asia, the Urakami Cathedral was destroyed. Only the Franciscan monastery, founded by St. Maximilian Maria Kolbe survived. 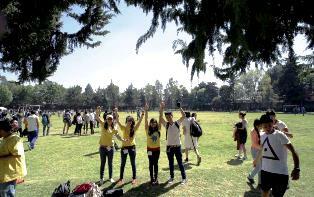 On the Young Believer Day, the sky was clear with a beautiful sun. The young crowd was coming on their own ahead of time, ready to give everything for the day, which aims to celebrate life among youth groups coming from all archdiocesan ecclesial realities. The program consisted in a series of active laboratories on topics of interest for young people that have been collected through the experience of companions, parents and priests who are responsible for the pastoral care. The topics dealt with faith, culture, hope and solidarity. There were also participating many young sick people and others with disabilities. Welcoming Eucharist took place at 10:30. It was attended by delegations of VidaFlorida families and the parish of St. John Paul II & St. Thomas More. Presided by Auxiliary Bishop Crispin Ojeda Márquez (VI Vicariate), concelebrated by Auxiliary Bishop Jorge Estrada Solórzano (V Vicariate) and over than 20 priests, many of them also young. The Icon of Our Lady, placed at the Main Altar could be seen from all angles of the hall. 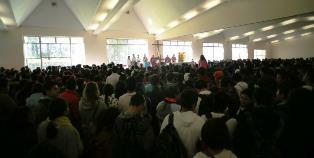 The homily was about courage need to say Yes to the Lord by young people. Bishop Ojeda, pastor of the hosting vicariate and representing His Eminence Archbishop of Mexico Card. Norberto Rivera Carrera, urged young people to approach God as at its time did St. Felipe de Jesus. In an absolutely radical way. Young people responded singing and clapping. Sacrament of Reconciliation was offered during Mass and throughout the day. During the Mass youth choir highlighted the hymn to St. John Paul II during his last visit to Mexico. and ask Her to intercede for their Christian vocation, their future and their dreams. and the Consecration to Our Lady at the back and the images of Czestochowa icon and Jesus Divine Mercy, in the front. 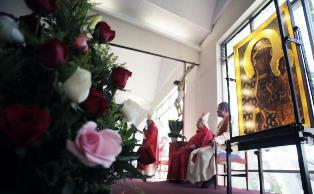 During the day, the Blessed Sacrament was exposed next to the relics of St. Felipe de Jesus. Among the pastoral groups that sponsored the day were Pro-Life Mexico National Committee, the Pontifical Foundation Aid to the Church in Need, Missionaries of the Holy Spirit and the Apostleship of the Cross, students and teachers of the Minor Seminary of Mexico, as well as youth care of emblematic congregations and religious orders present in the Archdiocese. 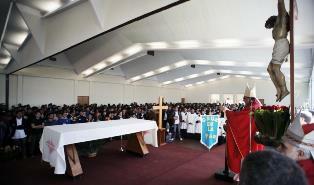 The icon visited the Minor Seminary of the Theological Seminary of Mexico, whose facilities include rooms, dining rooms, chapel, sports fields, classrooms and auditoriums. It is located in the VI Vicariate, within the metropolitan area and is one of the most representative of Mexican modern religious architecture. This is where future priests, still preparatory studies study, and where generations of diocesan priests were trained to serve one of the largest archdiocese in the world which consists of 8 regional vicariates. The Chapel of the complex was built by the architect Honorato Carrasco, renowned professor at the UNAM (National Autonomous University of Mexico) and who in 1965 competed as a student for it. At the time, this project represented an interesting architectural challenge: build a place of public worship on Sundays and private for the weekdays. The capacity is 400 people and includes booths, confessionals, sacristy, film projection room for 120 students. It was Cardinal Miranda y Gómez who commissioned the building of existing facilities with 5,000 square meters and designed by the architect Benlliure, who later participated in the project of the New Basilica of Guadalupe (1974 -1976). At the end of the day a group of youths took Our Lady back to the host parish, arriving in time for Sunday 7 pm Mass.